Banbury is a market town in northern Oxfordshire, located on the River Cherwell. It's on the edge of the Oxfordshire Cotswolds and has been a busy market town for centuries; now it's an important industrial centre which has grown considerably in size over the last hald of the 20th century. Banbury stands at the junction of two ancient roads: Salt Way, still used as a bridle path to the west and south of the town, and Banbury Lane. Until a few years ago the first signs of habitation in the area went back to a Roman villa at Wykham Park from the period around 250AD. However, in 2002, the remains of an Iron Age settlement dating back to 200BC were unearthed. The site contained almost 150 items, including pottery and grinding stones, and indications of buildings from the period. In the latter half of the 5th century the Saxons first developed Banbury by building to the west of the River Cherwell. In the year 913AD, the attack of the Danes benefitted Banbury by aiding the development of the town centre. This is reflected in Banbury's Market Place, its triangular shape being typical of the Danes. Alexander, Bishop of Lincoln, built Banbury Castle in the year 1135AD. The English Civil War, however, saw the end of it. Following a petition to the House of Commons in 1648 the castle was largely, but not completely, demolished and the reclaimed materials were used to repair other buildings damaged during the fighting. During the period of the Reformation Banbury had three crosses: the High Cross, a focal point used for public proclamations, the Bread Cross, associated with the distribution of bread to the poor each Good Friday, and the White Cross, which lay on the western boundary line of the old town borough. 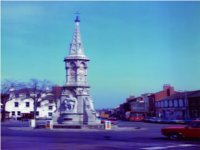 Nowadays, the only cross gracing Banbury lies at the intersection of four major roads - those to Oxford, Warwick, Shipston-on-Stour and the High Street, which leads to the shopping area and the old heart of the town. It was erected in 1859 to commemorate the marriage of Queen Victoria's eldest daughter Victoria Adelaide Mary Louisa to Friedrich Wilhelm of Prussia on 25th January 1858. Near the current Banbury Cross stands the domed parish church of St. Mary's, which was built between 1793 and 1827 to replace the previous church which burnt down in 1792. The town is famous for Banbury cakes, which are still available in a number of bakeries and restaurants locally: these delicious, flat pastries with their spicy, currant fillings have been made in the area to secret recipes since 1586 or earlier. The Banbury Area itself has only limited resources for places to go for some night life at the moment: there is one cinema and no theatres, apart from the Mill, which doubles as a Live Music Venue. A fair number of pubs put on live music and there are some nightclubs for dancing the night away: the Sound Exchange, the Chapel, Venus Night Club and Wonderlounge. The historic town of Banbury is an exciting place to shop, offering a wide range of independent and national brands to tempt you. If you have a walk in the Old Town or explore the modern Castle Quay Shopping Centre, you’ll find a vast array of retail outlets and businesses offering practically everything you need from leading national shops and brands to smaller independents and specialist shops. Moreover, there is a market on Thursdays and Saturdays as well as a Farmers Market on the First Friday of Every Month. The town centre retains a wealth of historic houses and public buildings. The newly opened Banbury Museum & Tooley’s Boatyard, alongside the Oxford Canal, is an impressive and ambitious project displaying the key elements that have forged the town’s history. The Oxford Canal passes through the town centre where it now plays an integral part of modern Banbury’s life. Other important sights are the Upton House, the Broughton Castle and the Sulgrave Manor. The climate is temperate and warm. There are rainfalls all over the year: it rains heavily also in the driest month, which is February. The rainiest month is, instead, August. The annual average temperature in Banbury is 9.5 °C: the hottest month is july, with approximately 16.2 °C, and the coldest month is january, with roughly 3 °C. Banbury railway station is on Bridge Street. It is served by the following railway companies: Chiltern Railways, Cross Country Trains and Wrexham and Shropshire Railway. Some local services are run by First Great Western. Plusbus is a ticket which allows you to add local bus travel in certain cities and towns to your train ticket, including Oxford, Swindon and Reading. As far as the bus service is concerned, the are buses with destinations within Banbury and others which carry you to its surroundings. Less frequent services link Barton-on-the-Heath, Chackmore, Duns Tew, Moreton-in-Marsh, Radford Semele, Towcester, Wellesbourne, and Witney. The National Express runs direct coaches through Banbury on their routes from Bradford to Poole, London to Rochdale, and Wolverhampton to Heathrow and Gatwick, with of course a huge range of other destinations with a change of vehicle.